Caregiving takes a huge toll on the economy. About 17% of full and part-time employees are also caregivers (in fact 73% of all caregivers are employed at another job). Businesses lose $34 billion/year in productivity from employees being distracted, cutting back hours, or leaving the workforce. Caregivers forsake income: their total estimated lost wages, pension and Social Security benefits is nearly $3 trillion. Caregivers and care recipients span all demographics, but they are primarily women (66%) and ages 35-64 (64%). Of the 65 million adult caregivers, 4 million care for children, 49 million care for adults, and 13 million care for both adults and children. Caregiving can be highly demanding. It involves far more than healthcare-in-the-home; it is about helping with life: activities of health and wellness (medications, therapies, exercise, tracking of symptoms, appointments, etc. ); basic living (bathing, grooming, toileting, dressing, eating, etc. ); basic chores (cooking, cleaning, shopping, money management, etc.) as well as social engagement and emotional support. On average, caregivers spend 20 hours per week; a third average 47 hours per week. And it can go on for many years: on average 4.6 years, while 15% have been providing care for over 10 years. Unsurprisingly, the non-economic impact — physical and mental health deterioration of caregivers and the fraying of family relationships — is significant. Demographic and economic realities are increasing need for (and demands on) family caregivers. People are living longer, and there are fewer offspring to handle their care. Paid home care workers are not filling the need. While the projected demand for such workers for 2008-18 is 50%, the growth of the 25-54 age female population (the main labor pool from which these workers are drawn) is only 2%. Low pay (barely above minimum wage) and low status of home care workers spurs high turnover, further aggravating the situation. Outsourcing is not an option, as few caregiving tasks can be performed remotely. Healthcare trends — cutbacks due to government and employer cost cutting, shorter hospital stays, and more home-care technologies — intensify the family caregiving burden. Policy makers, technologists and entrepreneurs must appreciate the prevalence, toll and context of caregiving in order to address this growing crisis. Caregiving is not a simple one-to-one relationship, but usually involves networks of relatives and friends. It is not only a healthcare issue, but also about managing life. And it is not just a brief crisis requiring heroic actions, but an overwhelming (and seemingly unending) series of wide-ranging, mundane tasks with minimal (if any) compensation. Caregivers step up to help friends and family in need; similarly, we must step up to provide support and solutions to help shoulder the burden of care. Much can be done; I suggest a couple of starting points. Design caregiver-support policies such that they acknowledge the primacy of the family in caregiving. Recognize that caregiving is about life and not just health, by reducing requirements for presence or approval of healthcare professionals. Develop tools and services that make management and coordination of daily caregiving easier, that are designed for long-term use, and are sufficiently flexible to accommodate un-foreseeable changes in specific care tasks. A brighter future is possible, if we can come together to create tools, systems and policies to accommodate the changing nature of how we take care of ourselves and others throughout life. posted by Rajiv Mehta, consultant and entrepreneur focused on technologies for personal and family health; co-organizer of the Quantified Self. We are a nation of caregivers. Every day over 44 million adults serve as unpaid caregivers to ailing or disabled relatives or friends, and annually 65 million do so—yet this form of work often goes uncompensated and is largely invisible. Unsurprisingly, inadequate awareness of the issues leads to inadequate policies and solutions. Nearly two-thirds of the U.S. federal budget, $2.2 trillion annually, is spent on just the four biggest warfare and welfare programs, Medicaid, Medicare, Defense and Social Security. In contrast the National Institutes of Health, which funds medical research, spends $31 billion annually, and the National Science Foundation spends just $7 billion. Putting innovation at the center of the national vision is not simply about spending more, it’s about how we approach all problems. Our ancestors were bold and industrious–they built a significant portion of our energy and road infrastructure more than half a century ago. It would be almost impossible to build that system today. Could we build the Hoover Dam today? We have the technology but do we have the will? Unfortunately, we cannot rely on the infrastructure of our past to travel to our future. Airports, an electricity smart grid that doesn’t throw millions into the dark every few years, ubiquitous Wi-Fi — these are among the important infrastructures of the 21st century, and they are caught in the regulatory thicket. posted by Alex Tabarrok, Associate Professor of Economics at George Mason University and blogger at Marginal Revolution. This post draws on his recent e-book from TED books, Launching the Innovation Renaissance and an article he wrote for The Atlantic. 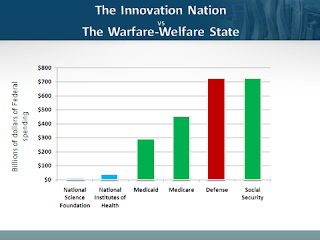 We like to think of ourselves as an innovation nation but our government is a warfare-welfare state. To build an economy for the 21st century we need to increase the rate of innovation and to do that we need to put innovation at the center of our national vision. Innovation, however, is not a priority of our massive federal government. Nearly two-thirds of the U.S. federal budget, $2.2 trillion annually, is spent on just the four biggest warfare and welfare programs, Medicaid, Medicare, Defense and Social Security. In contrast the National Institutes of Health, which funds medical research, spends $31 billion annually, and the National Science Foundation spends just $7 billion. Between the Elsevier boycott and the Bipartisan Federal Research Public Access Act working its way through Congress, there is plenty of talk about the need for openness in research. However, the results from Zooniverse.org, the suite of citizen science projects that I run with collaborators in the U.K., U.S. and around the world, show that access to data and information is only the beginning of what’s needed. Take the recent discovery of a likely planet candidate around one of the 150,000 stars monitored by NASA’s Kepler space telescope. Volunteers at planethunters.org sorting through public data returned by the spacecraft are able to discover previously unnoticed transits—the wink of a star as a planet passes in front of it. While the data is available for download from the Kepler archive, our interface allows hundreds of thousands of volunteers with no technical expertise to participate in cutting-edge science. This sort of experience removes the biggest barrier to participation and engagement: the misguided belief that nothing useful can be done by the amateur, that Science with a capital S is best left to Scientists in ivory laboratories. Once that barrier is broken down, volunteers are often motivated to do much more than just click on a website. Within 24 hours of launching GalaxyZoo.org (the original Zooniverse project), the site was receiving 70,000 classifications an hour. The project received more than 50 million classifications during its first year, from almost 150,000 people. The planet candidate I mentioned above was discovered and even modeled by volunteers long before the science team got to it. Over at GalaxyZoo, we’ve been following up on the Green Pea galaxies. These enigmatic systems, which owe their name to their small, round and green appearance in images scoured by volunteers and drawn from the Sloan Digital Sky Survey, were identified, catalogued and classified by a group of volunteers. They have turned out to be the most efficient factories of stars in the local universe. They now form the focus of much professional study, the results of which are reported to their eager discoverers via papers placed on the freely accessible arXiv.org repository. Examples like these abound, but even with access to scientific journals, many of the volunteers who tracked down the Peas would never have considered trawling the literature. Their discovery—made possible by the Galaxy Zoo interface and the Sloan Digital Sky Survey team’s decision to be open not only with their data but will the tools required to make sense of it—gave them the incentive and the motivation to dig much deeper than they would otherwise have done. This deeper exploration is enabled by a radical openness, marked by a commitment to enabling access to data at a level which is meaningful for the audience. It’s more expensive, more difficult and frankly more hassle than simply campaigning for the removal of payrolls, but it’s just as important. Luckily, sustained effort can bring remarkable rewards—just ask the more than 500,000 registered Zooniverse volunteers. posted by Chris Lintott, Chair of the Citizen Science Alliance which runs the citizen science projects at zooniverse.org. In many parts of science, we're not constrained by what data we can get, we're constrained by what we can do with the data we have. Citizen science is a very powerful way of solving that problem. video series, which puts a spotlight on a diverse array of innovators and gives them an opportunity to tell their stories: an interview between Jennifer Muhawi and Phesto Dee, two musicians building their careers online. Both have been professional musicians for over a decade. Since Phesto has been using the web for years and Jennifer recently started building her social media strategy, we thought it’d be interesting for Jennifer to interview Phesto and learn about his successes. The interview was conducted on Google+ and recorded with Camtasia. The discussion tracks some of the key themes of the Future of Music Coalition’s Artist Revenue Streams project (which we wrote about recently). Phesto has used the Internet to reach his audience, build a brand and make money. That said, as with any technology, there are also new challenges. In Jennifer’s case, she points out that she now has an abundance of options to reach her fans directly, and it can be hard to know which one is best for her. But artists are adapting to the medium, and the ones that do are reaping increasing rewards, both personal and financial. As Phesto says, interacting with fans can be hard work—but it’s fun, too. Next up in our Jack and Jill the Innovator video series, which puts a spotlight on a diverse array of innovators and gives them an opportunity to tell their stories: an interview between Jennifer Muhawi and Phesto Dee, two musicians building their careers online. Editor’s note: Andrew Crain is a telcom lawyer and scholar in residence at the Interdisciplinary Telecom Program at the University of Colorado. Because this blog explores examples of how data can drive decision making and improve the quality of our policies, this cross-post is especially fitting. Yesterday, I talked about the 60 percent of Americans who have a choice between two broadband providers with the capacity to handle any services they might use. The picture isn’t as rosy for the other 40 percent. Most of them (30 percent of U.S. households) will also have access to broadband at speeds that can now handle any services currently available, but only from the cable company. The remaining 10 percent will not have access to these enhanced speeds from anyone. The real difference is that the telecom speeds are now sufficient to handle any services customers use. That wasn’t true in the past, when the speed differences had a real-world impact. In the ‘90s, cable customers could download music in a reasonable time and watch YouTube videos, while many DSL customers could not. A few years later, cable broadband customers could watch TV shows on Hulu, while many DSL customers could not. More recently, the same was true for HD videos and movies. Now, for 60 percent of Americans, both cable and broadband services are more than adequate for streaming HD movies. And the fact that a large percentage of Americans can only get the top speeds from one provider isn’t new. In the early days of broadband, most households had access to service from only one provider (usually the cable provider). As speeds increased, many households had the choice of only cable service that could handle streaming video, while telecom broadband was well below 1 mbps. The cable companies used this speed advantage in the marketplace, and in the past they had a larger share of broadband customers than they do now. The most recent statistics from the FCC are as of the end of 2010, when 56.3 percent (43.3 of 76.9 million) of broadband connections were via cable modems. That number has been increasing in the last few years, but cable’s percent of total broadband consumer connections still is not as high as it was in the 90s, when they had nearly two-thirds of the market. Cable companies are again increasing market share, but it will be several years before they reach the levels they had in the ’90s. The FCC year-end 2010 report showed that the cable companies added 2.4 million broadband customers that year, while telecom companies added only 1 million. In other words, the cable companies gained 70% of the net broadband residential adds. The cable companies did even better last year. According to the Leichtman Research Group, the cable companies gained 67% of the new broadband wireline customers in the first quarter, 77% in the second quarter, and 83% in the third quarter. That sounds like a lot, but the focus on net adds is deceptive, because as broadband penetration has increased, the number of net adds has started to decline. Why is this significant? Because the fact that net adds have decelerated means that if the cable companies gain a large percentage of net adds, their share of total broadband residential connections will grow slowly. Assuming that net adds level out at the 2010 level of 3.5 million per year, and the cable companies’ rate of gain increases to 90% of new customers, their share of residential customers will increase to 62.6% in five years. That would be a significant gain, but the cable share of the wireline broadband market would still be lower than it was in the ‘90s. Even that number is likely overstated. It is more likely that net adds will continue to decline, which is only natural as the number of households with broadband increases to 70, 80 and 90 percent. Based upon current trends, the cable companies will probably add a couple of points to their percentage of total fixed broadband connections over the next half-decade. It is possible that a fundamental change in the market is underway, and the 2011 net add numbers indicate that cable’s rate of gain is accelerating. But a fundamental change in market structure will not happen unless the telecom companies start loosing a significant number of customers. Whether that will happen is yet to be seen. The fact that the competitive level of the broadband market hasn’t changed does not answer the ultimate question: is this level of competition good enough? And is is good enough for the 30 percent of Americans who have only one choice of very high speed broadband? more opportunities to make money, but how precisely are artists taking advantage of them? There are traditional metrics to measure the state of the music industry, like number of albums sold or number of spins on the radio, but they’re ill-suited for the digital age. They don’t help us understand whether emerging digital technologies are helping artists take home more money. The Future of Music Coalition’s (FMC) latest research project, Artist Revenue Streams, begins to tackle this challenge by exploring the ways that new technologies, like digital music stores and streaming services, impact US-based musicians’ careers and changed musicians’ earning capacities over time. They plan to release a dozen white papers that explore the specific outcomes from the data they collected via surveys, interviews and financial snapshots. As in any business and as always in the arts, musicians face challenges in making a profit. At the same time, the report counts 40 different revenue streams that artists can harness, and artists can tailor these to fit their own work. Of the 5,000 artists surveyed by FMC, 42% earned all of their personal annual income from music. The breakdown of this data will ultimately allow artists to assess the value of both traditional and digital technologies and services that contribute to total income for musicians. As both new and established artists plot their course for taking advantage of the increase in digital revenues, understanding which slice of the pie to invest time, energy and money into is an important, strategic move. For example, the first round of FMC’s data explores the changing relationship between artists, brands and earnings, making it clear that musicians’ decisions about a wide range of factors, from merchandising deals to corporate support, have an impact on their artistic reputation with fans, brands and funders. Policymakers can learn a lot from this data, too. Artists and entrepreneurs are creating fantastic new content, products and services online, and existing copyright laws both support and encourage this creativity by protecting artists from infringement and helping them secure fair compensation for their work. The Artist Revenue Streams project specifically has cross-genre and geographic layers of data that enables policymakers to see where laws and the market are already working well—as well as where targeted, narrowly-tailored solutions can help support artists. You can read more about the FMC project here, stay tuned for more findings. Despite the notion that in many ways the digital age has been detrimental to singers and songwriters, the truth is that more musicians are creating more music and distributing it in more ways than ever before. There are also more opportunities to make money, but how precisely are artists taking advantage of them? There are traditional metrics to measure the state of the music industry, like number of albums sold or number of spins on the radio, but they’re ill-suited for the digital age. They don’t help us understand whether emerging digital technologies are helping artists take home more money. San Francisco Municipal Transportation Agency (SFMTA) released its much-anticipated 2011 City Bicycle Count Report. Among the data contained in the 22-page document is one overarching finding: San Francisco is experiencing a bicycling boom. Just how big of a boom? A dramatic 71% increase in the number of people biking in the last five years. The 2011 report [PDF] showed that 22 of the 23 count stations, the numbers of riders increased in 2011. The count station at Market and 11th Streets, a major thoroughfare for downtown bicycle commuters, showed a 43% increase since last year, and a 115% increase since 2006. Market Street has a protected bike lane in this area, and bicycling advocates at the San Francisco Bicycle Coalition attribute much of the increase in ridership at this count station to this separated bikeway. Perhaps the most telling statistic is the increase of bicycle counts at locations with new bicycle infrastructure added this year. In 2011, more than 17 miles of bike lanes were added to San Francisco streets, including 2.5 miles of buffered bikeways. Bicycle count locations with new bike lanes showed an especially large increase in ridership. For example, Townsend Street had bike lanes striped in 2011 and showed a 54% increase in counts. In addition to the positive findings, the Bicycle Count Report also shows that San Francisco has a long way to go before reaching the city’s official goal of 20% of trips by bicycle by 2020. The 2011 report shows that 3.5% of San Francisco trips are done by bicycle, higher than the national average, but still not there. In order to move us closer to ridership goals and invite more people to bike, the San Francisco Bicycle Coalition has developed an ambitious vision for San Francisco of 100 miles of safe, comfortable and inviting crosstown bikeways called Connecting the City. The campaign’s website uses videos, interactive maps, computer-generated visual mock-ups, and illustrated schematics to help riders and policymakers imagine the potential benefits of each route. What’s next for San Francisco biking? Mayor Edwin Lee has called San Francisco a national leader in biking, and the report says, “the SFMTA is committed to growing bicycle ridership, providing new infrastructure, and improving the safety of bicycling in San Francisco.” The San Francisco Bicycle Coalition is working hard to help the city use this valuable data to begin immediately implementing the policy strategies that will increase bicycling even more dramatically in the years to come. Last week, the San Francisco Municipal Transportation Agency (SFMTA) released its much-anticipated 2011 City Bicycle Count Report. Among the data contained in the 22-page document is one overarching finding: San Francisco is experiencing a bicycling boom. Just how big of a boom? A dramatic 71% increase in the number of people biking in the last five years. , to modern day collaborative maps built by millions of citizen cartographers around the world. Using maps, we can look at how the world around us has changed. We can also use maps to govern more effectively, save lives or just find the cheapest beer. But what makes maps really exciting isn’t what they can tell us about our past or present, but what they could potentially tell us about our future, both good and bad. A recent Fast Company piece entitled, “Google Maps Help Predict Meth Labs Before They Open” touches on this idea. In his 2009 book, Geography and the Drug Addiction, Dr. Max Lu took three years of data around meth lab seizures and used it to show the likely spread of those meth labs in the future. Thousands of miles away, predictive analysis was being used by GeoEye to map political conflict and refugees in central Africa. Using the AnthroMapper and Signature Analyst tools, GeoEye’s analysts were able to identify the pattern of both the Lord’s Resistance Army and related refugee populations. They then used statistical models to represent the geospatial “signature” of this activity and identified regions where new conflict was more likely to occur in the future. Combining this model with population density statistics helped NGOs, local governments and the military focus their resources. Given these two examples of predictive mapping in fighting crime and political violence, I’d like to pose this question to all of you: what else can we predict using maps, and how can maps help us make better decisions? If we’re able to map out historical deforestation using satellite imagery, shouldn’t we be able to map future deforestation as well? Using that same satellite imagery, shouldn’t we be able to combine those deforestation maps with historical flood data to predict the next food shortage? Maps are powerful tools that, combined with the right data, can help us make better public policy decisions. It’s also why policy makers must protect and encourage geospatial technology. From climate science to fighting crime, the possibilities are endless. I’d like to think predicting the future is a good place to start. Maps have evolved in some pretty amazing ways, from the night sky maps carved onto cave walls in Lascaux, to modern day collaborative maps built by millions of citizen cartographers around the world. Using maps, we can look at how the world around us has changed. We can also use maps to govern more effectively, save lives or just find the cheapest beer. memorial fund for him a week after he was murdered. Some of these friends had known him for as many as twelve years. Few had ever met him in person. These friends all played an online video game called Subspace. The game came out in 1997—making it one of the earliest massively multiplayer online games—and it has a simple premise: fly around in 2D spaceships shooting at each other. Even though the game was commercially abandoned shortly after its release, devoted users reverse engineered it and released an open source version so they could keep playing and add security improvements. The game’s genius is that users can reinvent it—they can set up their own gaming servers with a unique map and altered settings. One of these user-generated versions attempts to emulate hockey: users “check” each other by shooting their guns and control a fiery ball inside a hockey rink. The Realistic Subspace Hockey League (RSHL), where players form teams and try to win a coveted trophy, just wrapped up its 18th season. They keep stats, and even make their own editions of Sportscenter. More importantly, they chat. The last time I checked in on the RSHL was about seven years ago. I found familiar names from my playing days like Matthew (or white_0men, as he was known in-game), as well as many, many new players. In fact, most of the current players only picked up the game relatively recently, well after it was commercially abandoned. Nearly two years ago, I got an email that brought me back to Center Ice, the website hub where the hockey players congregate. white_0men was killed during a robbery at his business in Los Angeles, and his friends were alerting all players, past and present, about the donation fund for his family and a memorial message thread (now hundreds of messages long). Center Ice may be an anomaly, though that seems unlikely today, when hundreds of millions of people participate in online games like World of Warcraft and virtual worlds like Second Life. Certainly, many are casual gamers or only form loose connections with most of the people they meet each day, just as you don’t necessarily invite the clerk at your corner store over to dinner at your home. But, given the mass scale of gaming today, even if only a small percentage participate in communities like Center Ice, that is still significant in absolute numbers. The composition of these communities likely looks quite different than the stereotype of the pimply faced male gamer. Forty-two percent of all video game players in the U.S. are women, and 40 year-old moms are the most frequent players of Farmville. There are multi-billion dollar economies in virtual goods that are bought and sold for use within such games. Just like in the physical world, public policy is only one way to shape behavior in these online communities—code, markets and norms can be much more important. If you’re interested in learning more about how this particular community is composed, shaped and regulated, you can read more about about life in Subspace based on interviews with its players here. Matthew Butcher’s hockey teammates started a memorial fund for him a week after he was murdered. Some of these friends had known him for as many as twelve years. Few had ever met him in person.